St Cloud, MN – A Restaurant Night Fundraiser will be held in honor of Dylan R, a Rice-area child who had a Kidney transplant. The event is planned for Tuesday, July 26, 2016, at participating Panera Bread in St Cloud, MN. 16-year-old Dylan has received a Kidney transplant at the University of Minnesota Children’s Masonic Hospital. Funds are being raised to assist with transplant-related expenses. 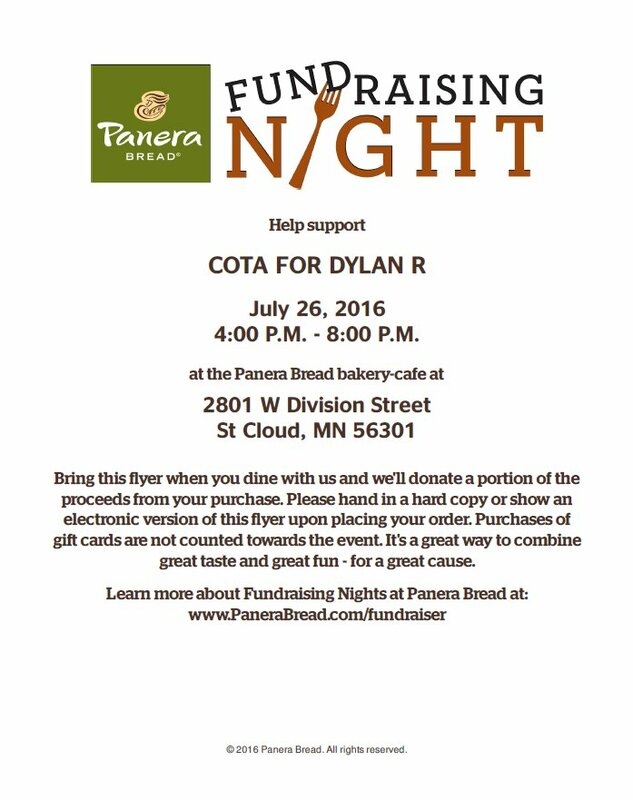 Panera Bread of St Cloud will contribute a portion of the sales to COTA for Dylan R. Again the date is Tuesday, July 26, 2016 from 4 pm to 8 pm – you MUST present a copy of the flyer when ordering. Dylan is the focus of a local fundraising campaign to assist with transplant-related expenses. Dylan was diagnosed with End Stage Renal Kidney Disease. Dylan’s family needs an estimated $30,000 to help pay transplant-related expenses for Dylan’s lifetime. Dylan’s family has asked for assistance from the Children’s Organ Transplant Association (COTA), a national charity based in Bloomington, Indiana. COTA is dedicated to organizing and guiding communities in raising funds for transplant-related expenses. COTA’s services are completely free of charge, and 100% of funds generated by COTA community fundraising campaigns are available for transplant-related expenses.